Philadelphia police adjusted the security plan for the Philly Pride Parade and Festival in light of the overnight shootings at a popular gay nightclub in Orlando, Florida. 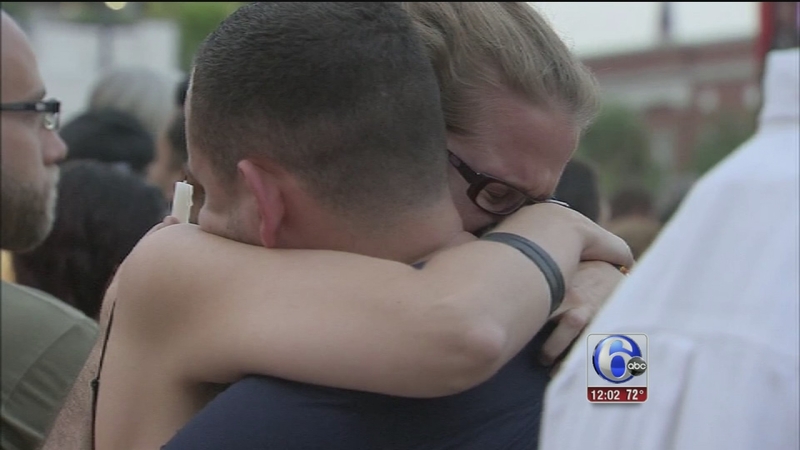 PENN'S LANDING (WPVI) -- While many were shaken by the mass shooting overnight, that did not stop tens of thousands of people from celebrating gay pride here in Philadelphia, many saying they wanted to be here to honor the lives lost in Orlando. Draped in rainbow flags, beads and costumes, they marched down city strets, maybe with a little more pride than usual. "I think it just makes it all the more important that people do come out and show that they're proud to be here," said Zach Smolsky of Franklinville, New Jersey. The annual Philly Pride Parade was held just hours after the mass shooting at Pulse, a popular gay nightclub in Orlando. A moment of silence was held to remember the victims. Some found out about the shooting at the parade. "I was kind of scared because I'm walking handing out beads and the next thing I hear, 'Oh did you hear about the shooting in Orlando?' " said Reginald Weeks of Willingboro, New Jersey. Some attendees wondered if they should attend after hearing the news. "Because I was afraid something would happen," said Jack Pulcher of West Mount Airy. "But when your number's up, its up, no matter where you are or what you're doing." "It's a senseless tragedy that happens in our country far too often, and I don't know what the answer is to it other than trying to keep ourselves as safe as possible," said Philadelphia Mayor Jim Kenney. The mayor is scheduled to participate in a candlelight vigil for the victims Monday at 6:45 p.m. Bags were searched as people made their way into the Philly Pride Festival at Penn's Landing. Philadelphia police adjusted the security plan for the typically-peaceful event in light of the shootings overnight. "The main thing we wanted to do was be a little more visible than we are in other years. We certainly don't want to make people feel over-policed, but in light of what happened overnight, we thought it would make people feel comfortable to see police nearby," said Philadelphia Police Chief Inspector Joe Sullivan. The Philadelphia Police Department hasn't received any information regarding any direct threat to this city; however, as a result of the recent incident in Orlando we have increased our awareness and presence throughout the city. Officers have been instructed to be vigilant and to patrol any area that could be of concern. The department will continue to monitor the events of last night in Orlando and work with our federal partners to ensure the safety of our citizens here in Philadelphia. Our thoughts and prayers are with the many victims and families impacted by this tragedy in Orlando. We encourage citizens here in Philadelphia to be vigilant and as always, if you see something say something by calling 911 and inform us of anything suspicious.